The Game released the clip for his Drake-featuring track “100” today. 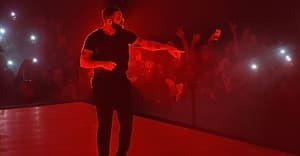 The song is about the solidarity between the two rappers, as the Game assures Drake that he’ll provide the MC with a bullet-proof vest every time he comes to town. In the video, the Game proudly sports a red Toronto Blue Jays jersey. Earlier this year, Game weighed in on the Lil Wayne vs. Young Thug dispute, but at the moment, he has not taken sides in Drake vs. Meek Mill. Game compares himself positively to Meek in his second verse: He was Lil Snupe, I was Meek Mill. He also declares, You dissin' Drizzy, that's cool, but don't come to my city. Find out what Drake said in 2009 about rap beef.